مدنی فر, محمد رضا, سجادیه, نرگس. (1388). برنامه درسی مغفول در آموزش مهندسی. فصلنامه آموزش مهندسی ایران, 11(43), 81-98. محمد رضا مدنی فر; نرگس سجادیه. "برنامه درسی مغفول در آموزش مهندسی". فصلنامه آموزش مهندسی ایران, 11, 43, 1388, 81-98. مدنی فر, محمد رضا, سجادیه, نرگس. (1388). 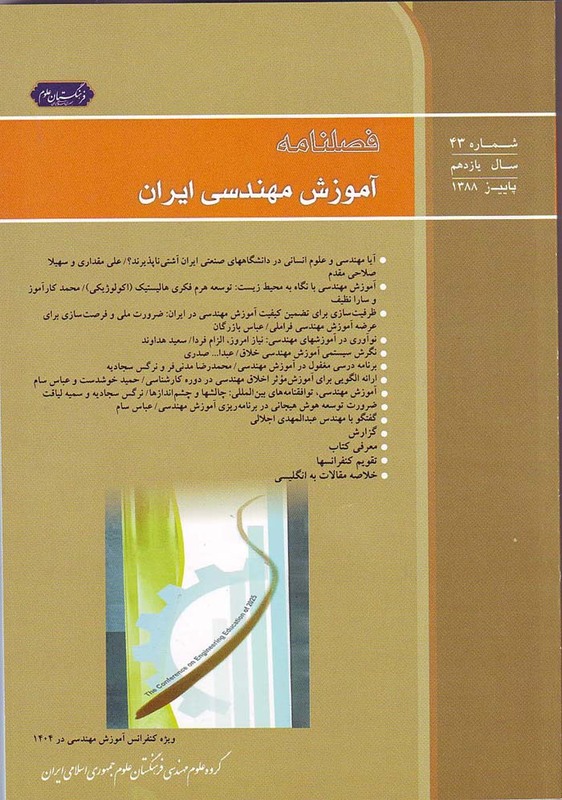 'برنامه درسی مغفول در آموزش مهندسی', فصلنامه آموزش مهندسی ایران, 11(43), pp. 81-98. مدنی فر, محمد رضا, سجادیه, نرگس. برنامه درسی مغفول در آموزش مهندسی. فصلنامه آموزش مهندسی ایران, 1388; 11(43): 81-98. A null curriculum is a part of ideal curriculum which is dissembled. This part of education emerges in both educational politics and instructional classes. A null curriculum is defined by a desire curriculum. In this paper, it is tried to define the null curriculum in engineering education. This definition is done by two ways. The first is comparing local engineering programs with universal standards and the second, is pathology of engineers’ workmanship in their jobs. Moreover, we examined general requirements of engineering education programs. These general requirements have some implications in cognitive, motive and skill areas. In cognitive zone, we explained the awareness of organization structure in engineering activities. Regarding organization structure, engineers can do their tasks well. Supporting engineers’ motivations is the second requirement that is studied later. The real work space is full of challenges. Therefore, engineers should be strong enough to challenge with such problems. Regarding these challenges, we have to make strong engineering educational system for confronting the students with their future professional activities. With such explanation, in the last section, we concentrated on social and scientific communication skills. Without these skills, engineer knowledge can’t be productive with adequate understanding.